Pre Diabetes Symptoms: Do you have pre diabetes? Here's a fact: Most people diagnosed with Type 2 diabetes had pre diabetes symptoms. If their doctor had warned them, they could have made diet and lifestyle changes to try and avoid a type 2 diagnosis. But most physicians only pay attention to fasting blood sugar when watching for diabetes. For instance, if a patient's blood sugar is between 110-125, mg/dL, it indicates prediabetes. But blood sugar results can test in normal ranges even as type 2 diabetes is developing. If people with a type 2 diabetes diagnosis knew ALL of the pre diabetic symptoms for which to watch, it could help them avoid a future diagnosis of type 2 diabetes. Prediabetes is defined medically as the state in which fasting blood sugar levels are higher than normal but not high enough to be classified as type 2 diabetes. Blood sugars in the prediabetic range (between 100 - 126 mg/dl) indicate insulin resistance is developing, and a metabolic syndrome diagnosis is more likely in the future. Insulin resistance (IR) is a condition in which chronically elevated blood sugar and insulin levels have resulted in an inability of body cells to respond to them normally. IR is the driving factor. In my opinion, insulin resistance, metabolic syndrome, gestational diabetes, prediabetes and type 2 diabetes are all progressive points on a continually worsening path. The picture below illustrates this. Medical information about pre diabetes from the American Diabetes Association say that the condition is evident when fasting blood sugar is between 100-125 mg/dl. However, I am convinced that signs of prediabetes can be spotted even when blood tests indicated blood sugars below 100 mg/dl. I saw this in my own life. Eight years ago, I had many of the pre diabetic symptoms listed below, but my fasting blood sugar was still classified as "normal" because it stayed under 100 mg/dl. My physician at the time never said a word about my blood sugar, and the labs listed it as “normal.” I think I would now have diabetes if I had relied on that test alone as an indicator of my state of health. 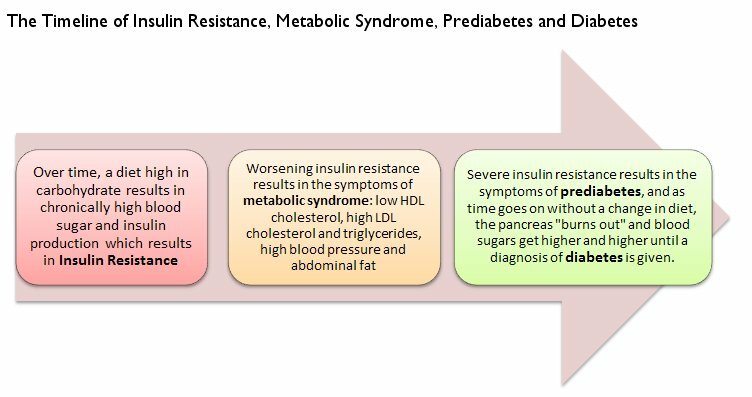 I think the pre diabetes symptoms listed below indicate that a person’s insulin resistance is increasing. If you have these symptoms, I strongly urge you to consider that you may be carb-intolerant and in need of a change in diet. The more of these symptoms you have, the more likely you are on a path toward a diagnosis of type 2 diabetes. Do You Have These Pre Diabetes Symptoms? ﻿After every meal, you really crave something sweet, even if you are already feeling full. A groggy, sleepy feeling after meals, even when you have plenty of rest. You may have been embarrassed because you fell asleep at your desk at work, or during a meeting. Blurred vision that seems to be worsening, and trouble seeing at night. Constant hunger, no matter how much you eat. You often think, "How can I be hungry? I just ate!" Heartburn, especially during sleep; a diagnosis of acid reflux or GERD – Gastroesophageal Reflux Disease. Digestive issues. You get frequent stomach aches, and are constantly dealing with gas pain, bloating and stool issues, cycling between diarrhea and constipation. Unexplained weight gain. Your eating habits haven't changed, but suddenly you've put on 10 pounds. In addition, you are having difficulty losing it, even when you exercise and eat less. A constant feeling of being tired. No matter how much you sleep, or exercise to gain strength, you feel fatigued. Frequent bouts of depression for no reason. You’ll be fine, and then you feel sad all of a sudden, without any cause. Constant joint aches, and muscle and joint stiffness when you wake up in the morning. You may even have been diagnosed with some form of arthritis. Your feet burn and your toes feel numb when you stand for long periods of time. Swollen ankles, and a general feeling of puffiness or water retention, especially if you sit for long periods of time. If you don’t eat, you get really grumpy. You may also feel nauseous and shaky. Waking up in middle of the night with your heart pounding. Often, you also feel nauseated or cold. It happens more often if you've been eating high sugar meals. This again indicates hypoglycemia or low blood sugar. Frequent yeast infections, and cuts or bruises that don’t seem to heal quickly. You have elevated blood pressure. Routine blood tests indicate you have high triglyceride levels, and low HDL cholesterol levels. The dentist tells you that have gingivitis, even though you brush and floss every day. You often wake up with a nasty taste in your mouth, even though you brush before bed. Breathing issues, especially at night; you may have been diagnosed with sleep apnea. Many of these pre diabetes symptoms could also indicate an intolerance to grain based foods, such as wheat and rye, a condition called gluten sensitivity. Following a low carb, gluten-free diet could provide some relief. I also think these symptoms can indicate the development of an autoimmune condition such as Celiac disease or rheumatoid arthritis. As serious as these sound, it just takes some simple changes to reverse these pre diabetes symptoms. You need only lower your carbohydrate intake, and add high intensity interval exercise to your life, and you should consider eliminating all gluten from your diet. I also suggest that you pick up a glucometer and some testing strips at your local pharmacy and start tracking your food intake and blood sugar (glucose) levels so you can determine which foods cause your blood sugars to spike. Keeping track of your personal blood glucose baseline and the effects of various foods on your blood sugar is a great way to monitor your insulin resistance and pre diabetes symptom treatments over time. ,Not only can pre diabetes symptoms be reversed, but people who have already been diagnosed can reverse many Type 2 diabetes symptoms with a change in diet. My ebook "Conquer Type 2 Diabetes with a Ketogenic Diet" coauthored with Dr. Keith Runyan, gives the details on using a ketogenic diet to reverse prediabetes and type 2 diabetes. Dietary changes are a powerful tool for reestablishing good health. Reducing your total carb intake (avoiding starches, sugar and grain consumption) and choosing to eat a higher fat, moderate protein diet are the key to reversing insulin resistance and prediabetes. While it seems difficult at first, you can do this and you will gain great rewards for making these changes, as they are extremely effective. Here's a nice article on one woman's personal story of reversing prediabetes.